Start by reviewing your overall site-wide metrics. 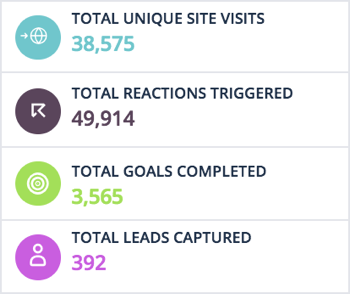 See your top 5 most active Reactions and click through to reveal more in-depth analytics. Also review your top 5 best performing Goals to ensure you’re driving relevant results. Lastly, see a breakdown of your site traffic by channel: Desktop, Mobile, and Tablet. Make sure you are showing Reactions to the channel with the highest traffic.